Autumn has been particularly beautiful this year. 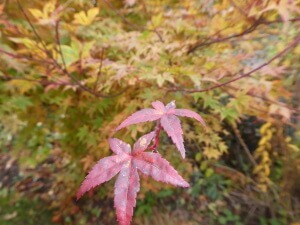 In our garden it began with the reds on our Virginia Creeper and has now mellowed to golds, yellows and oranges of the acer. We often visit Batsford Arboretum at Moreton-in-Marsh but we tried the small one at Arley- just above the Severn Valley, and its steam railway. I loved the collection of acers and the view across the valley. 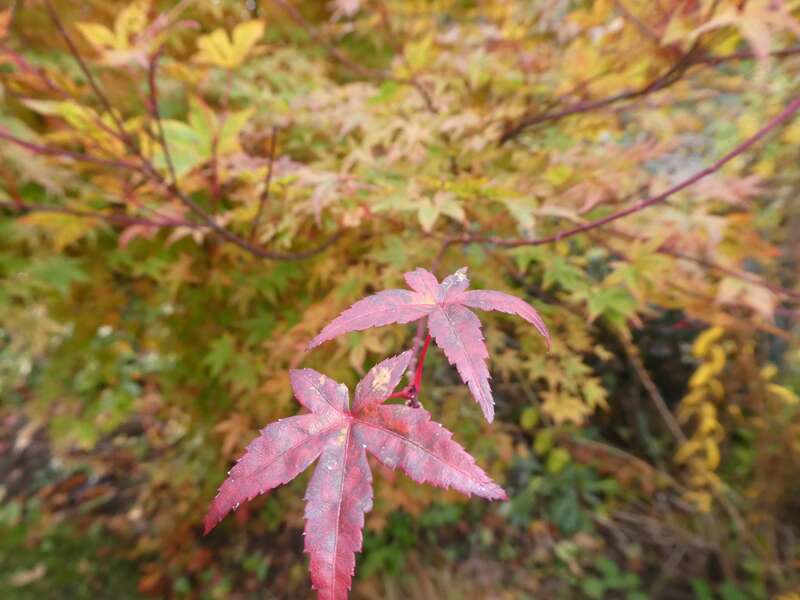 When I went to Nottcutt’s garden centre on the edge of Birmingham, at my sister’s suggestion I looked for an acer osakazubri which used attract customers when its leaves turned red. 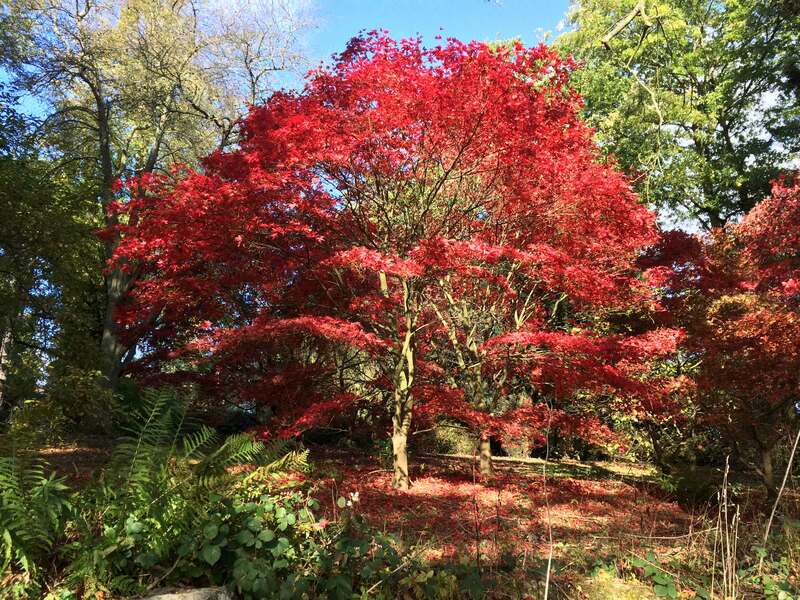 I found an acer, near what is known as the Cottage, and though it remains stunning it is out of the way, put out to grass. I am not even sure that it was that variety as it wasn’t labelled. My writing is going underground. In the novel, I am telling the story who are struggling to get their relationship back on track while I am learning how to write about trauma through an online Poetry Society course. 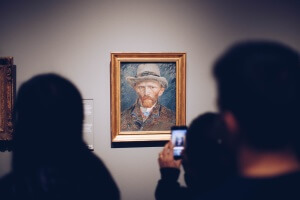 Maybe that is part of the reason I went to the Courtauld Institute’s Impressionist Exhibition being shown at the National Gallery in London. For me pride of place went to Edouart Manet’s A Bar at the Folies-Bergere. There used to be a wine bar in Leamington, Wilde’s and there was a print of this painting behind the bar. Luckily for customers, the staff were not as melancholy as the woman in the painting. It is a painting evocative of many moods- her beauty, the deep blue of her dress, the foil tops of the champagne bottles and in front of her, but reflected in the mirror, a rather dapper, threatening man. Not quite the customer from hell but not a man I would want to chat to over a glass of wine. Other painters represented were Daumier, Renoir, Cezanne, van Gogh, Seurat, Pissarro and Monet. I was sorry Daumier’s career was dismissed in the audio tape in a few sentences. 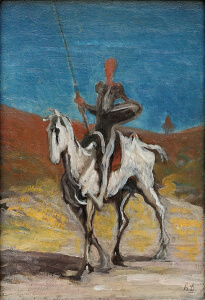 There were two of his paintings of Don Quixote. Both simply executed and rather sad. 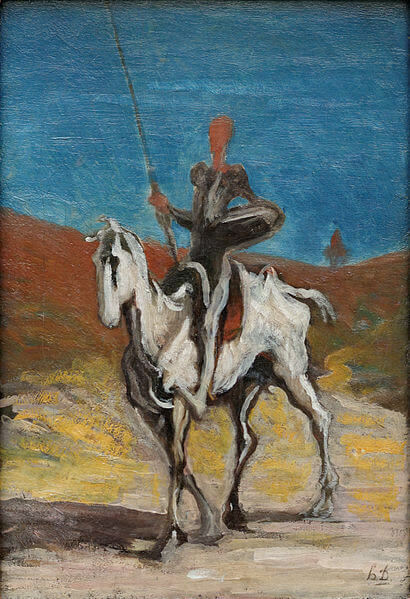 Daumier himself died in poverty, having lived through monarchy and republics and needing sponsorship from both. He earned his living as a cartoonist and was imprisoned for his lack of respect to Louis – showed him sitting on a toilet. His friends tried to help him financially by having an exhibition of his work, but, at the time, he seems to have been appreciated more by artists than the public. One piece I hadn’t viewed before was The Boulevard Montmartre at Night. Apparently Pisarro painted several from his hotel room at different times of the day, and at different times of the year. The composition I liked because of the straight lines of taxis. This was 1897 so horse-drawn and an empty space in the centre of the boulevard, pedestrians stepping from road to pavement. Again some beautiful colours. It is the time of year when I think of all the men all over the world who left their homes to fight in a war which proved horrific for them and for the women who nursed them. So many lives destroyed because they stood in the path of war. Today veterans still have to pick up the pieces of their broken lives. Maybe another reason I searched for colour.